Abstract in yellow tones – Josef Mikl. 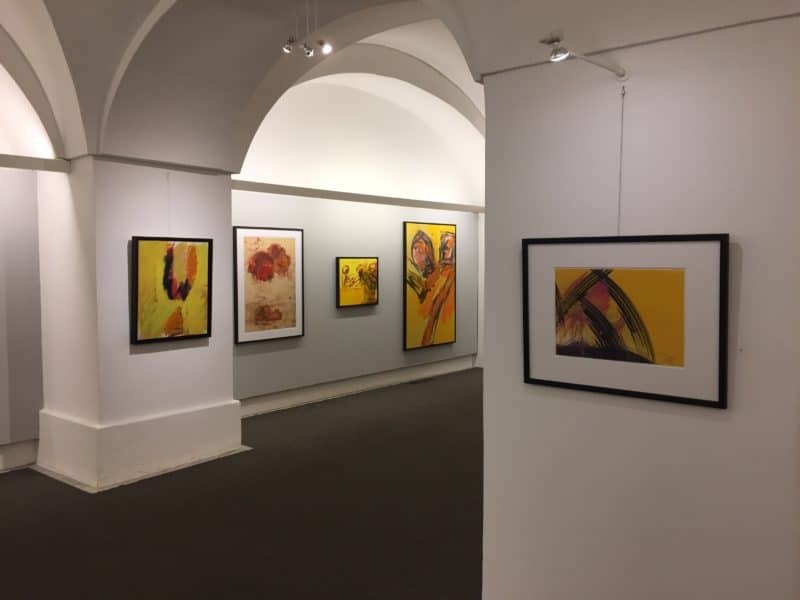 Expressive yellow tones shine towards you when you currently enter the beautiful old vaults in the back of the Galerie Welz in the center of Salzburg. The artist of the current festival exhibition (until the end of this week) is Josef Mikl (1929-2008). Even if not all exhibited paintings had yellow as their dominant color, those paintings with a yellow background still set the tone for the whole exhibition. The abstract figures and objects depicted on this background are mostly in various shades of red and grey. The resulting color nuances are partly orange or blue-grey. Other images are loosened up by components in clear blue. In between, you can find some paintings with peach to light pink backgrounds and purple to violet shades in the foreground. For an important representative and co-founder of the Austrian Informal Art, many of the figures are surprisingly concrete. Bread, mandarins, quinces, sunflowers, and a plum tree are clearly visible. The people in the inn, the two friends and the characters in several paintings entitled “Two Figures” can also be identified relatively easily as persons. Some older paintings have a certain similarity to the Prismaism of Lyonel Feininger. 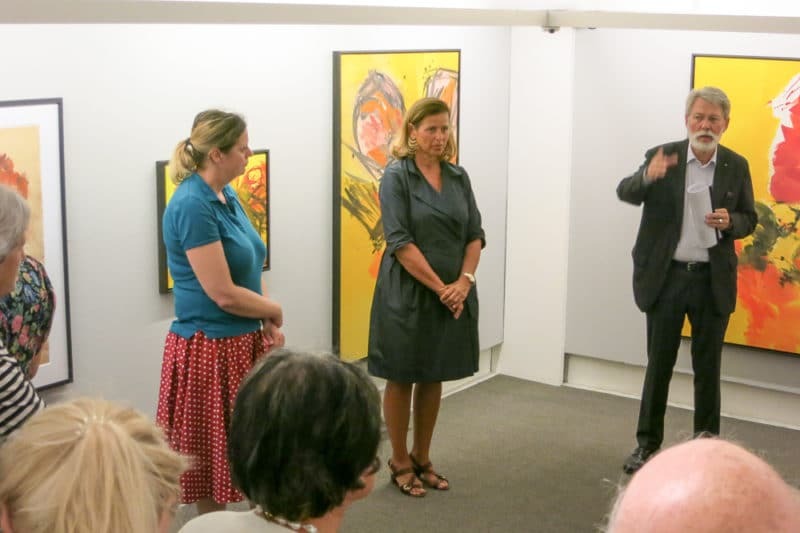 The exhibition was opened on 21 July 2018 by Hubert Lendl, gallery owner and managing director of Galerie Welz, together with Brigitte Bruckner-Mikl. Also present was Gabriele Baumgartner, who has been working on Josef Mikl’s estate since 2010. She was asked to come forward during the opening. Josef Mikl is one of the most important representatives of the Austrian Informal. Although he was born and died in Vienna, he has a strong connection to Salzburg. 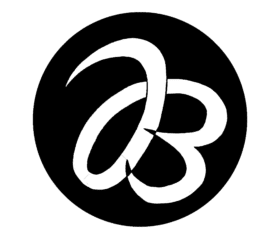 This was created especially through the artistic design of church windows in Parsch and Lehen, as well as the Emmaus Chapel in the St. Virgil Education Centre in Salzburg. 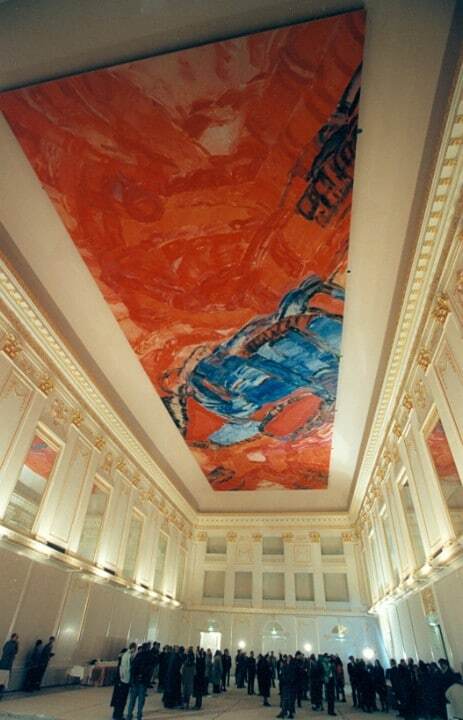 Brigitte Bruckner-Mikl was Josef Mikl’s technical assistant from 1994 – 96 for the design of the Great Redouten Hall of the Vienna Hofburg. She told about the unbelievable effort that was necessary to install the 404 m² canvas on the ceiling of the Redoutensaal. The production of ceiling and wall paintings took several years, so it is not surprising that Josef Mikl’s list of works shows a large gap at this time. The exhibition runs until Saturday, September 1, 2018. The Vienna-born painter belongs to the generation of artists who helped shape the development of abstract painting in Austria in Vienna in the 1950s. 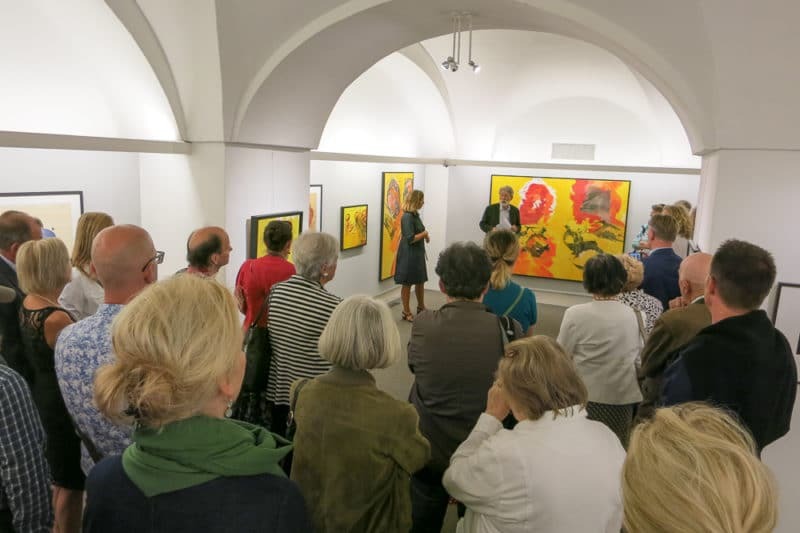 Hollegha, Prachensky, Rainer, and Mikl met in the St. Stephan Gallery of Monsignor Otto Mauer, at that time the center of modern painting that was open to the new trends, and formed a group. Initially, Mikl’s paintings are dominated by firmly joined structures that lead to a painting strictly built of beams, tubes, rods and colored surfaces. Mechanical aspects determine the character of the paintings. Later, the idea of nature became increasingly established as the defining principle of his artistic work. The determining theme in Mikl’s oeuvre is also the body. The artistic realization is the play of forms and colors laid over it. Mikl’s painting style is characterized by a generous spontaneous brushstroke. His paintings are highly abstract but never slip into non-representationalism. The starting point is a concrete visual experience. It is about transforming what we see into images.